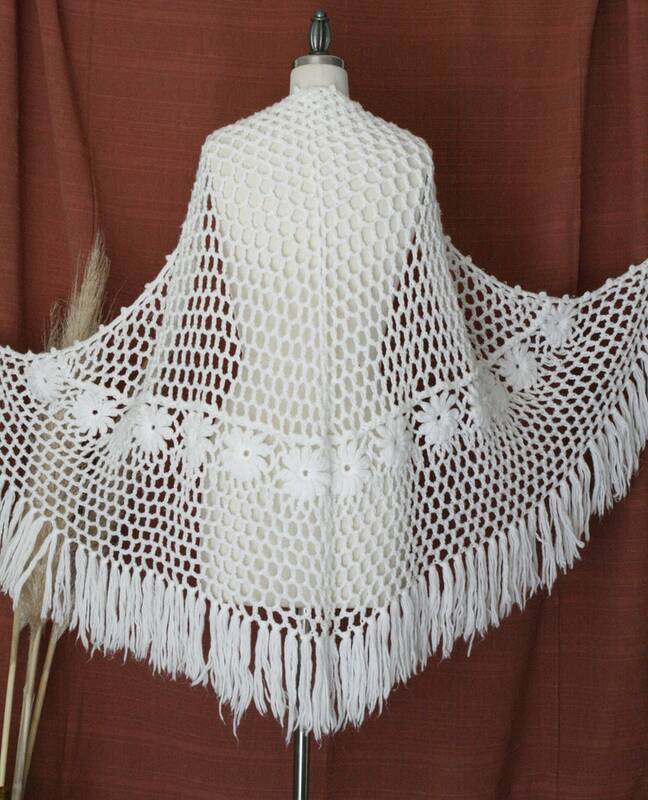 Handmade triangle shawl with fringe with a lace pattern. Great vintage condition. Normal wear. No stains or holes. Purchase more than one listing and I will combine shipping. Shipping overage over $1.00 will be refunded. Item that came was not as described nor pictured and seller takes no returns. Will never buy again. Customer service is my number one priority. I tried to work with the customer so they would be happy with their transaction. The item was purchased at a deep discount and I offered an additional refund. I was more than willing to work with the customer but I never heard back. California sales tax will be added to all purchases within California. I do not accept returns and exchanges but please contact me if you have any problems with your purchase. Please note I do not offer express or overnight shipping. CUSTOMS: International Buyers are responsible for ALL customs charges. ***INTERNATIONAL BUYERS please be aware that I am unable to be responsible for any fees that your postal company in your country of residence requires. Please look into what fees are required at your local post office BEFORE purchasing from our shop. Any fees charged by your customs office are the responsibility of the buyer and not Caramelos Vintage. If you're unaware about policies or additional fees please contact your local postal office to familiarize yourself with any added costs that need to be paid on arrival in order to receive your package.